It’s finally October! What does that mean? It’s nearly Halloween! 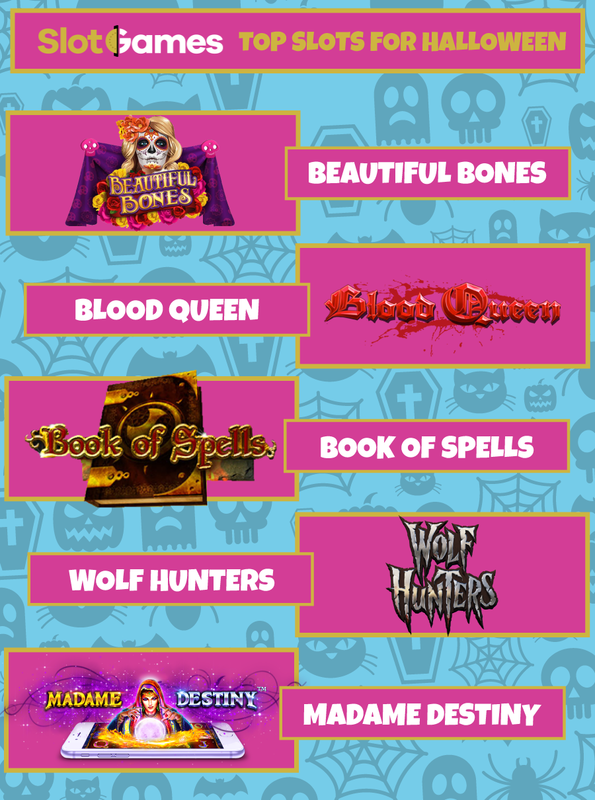 Here at Slot Games, we love this Spooktacular holiday and we have been hard at work to find you the best slots you should be playing at this time of year. Have no fear, there are no ghosties or ghoulies lurking here! Just free spins and some amazing wins await. Here are some of the best games we have on offer which are sure to put you in a Halloween mood. Celebrating the other festival of Halloween, Beautiful Bones by Microgaming is a gorgeous ‘Day of the Dead’-inspired slot. The characters are decked out in intricate sugar skull makeup while Wilds are forged on the reels and you collect tiny skulls on your way to free spins and a brilliant win multiplier. All vampire fans should make their way to Iron Dog’s amazing Blood Queen! Get caught up in the tragic love story of the Queen and Van Hell and choose a side in the free spins for the chance to grab some fantastic wins with the help of either travelling or expanded Wilds! Get ready for all things witchy with Book of Spells. This little delight from Tom Horn Gaming takes some of the whimsy of witchcraft and grounds it firmly in a Halloween setting. You have not just free spins and expanding symbols but an amazing gamble feature where you can double your winnings in a simple game of chance. Looking as beautiful as any set from a classic horror film, Wolf Hunters is Yggdrasil Gaming’s offering for the Halloween fun. You join two intrepid Hunters as they track down a fearsome Werewolf. With 3 different free spin games plus sticky and expanded Wilds, you definitely don’t want to be missing this hunt! Ah… What will the crystal ball of Madame Destiny reveal for you? We can see some big wins heading your way… and some free spins. Oh, and every win with Madame Destiny’s scatter will earn you a great win multiplier… The future is fickle, my friends. Will you manage to win big? Relive the classic horror film with this fun slot! With giant symbols, some great free spins, and all the hallmarks of the film which changed the horror genre, what better way to get into the Halloween spirit than with this amazing game! We firmly believe in no tricks at Slot Games; just lots and lots of treats! All of the above games are available for you to play with us right now. Even if you don’t fancy a Halloween game, never fear! We have an impressive catalogue featuring all the latest and greatest games in the industry. You will never struggle to find something to play here; keep checking back to keep on top of all the amazing new titles we are adding! What are you waiting for? Whether it is a ghoulish delight or an ordinary princess affair, dive in and start playing today!